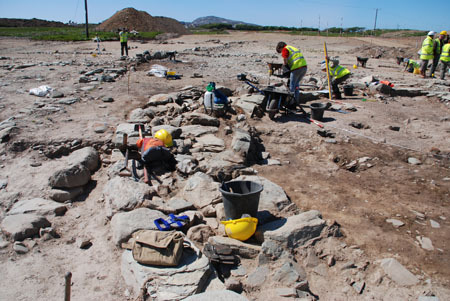 Between November 2006 and the end of June 2008 Gwynedd Archaeological Trust carried out archaeological excavation in advance of the construction of a major Welsh Government development site, called Parc Cybi, at Holyhead. The engineering consultancy, Atkins, in association with local construction company, Jones Brothers, managed the first phase of construction works for the Welsh Government, involving the building of roads and other infrastructure on the site. Over 20 hectares were carefully stripped of topsoil to reveal an archaeological landscape, which was then excavated and recorded. At its height the excavation employed a team of 40 archaeologists working on site full-time - one of the largest excavations in the UK. The highlights of the excavation were the remains of a 6000 year old Neolithic timber hall and a stone-built Iron Age roundhouse settlement with a complex history of development. However there were many other features including a Neolithic pit containing a stone macehead, Bronze Age and medieval cemeteries and remains of 18th and 19th century farms. The excavation results have demonstrated how people lived and farmed the land from 6000 years ago until the present day. 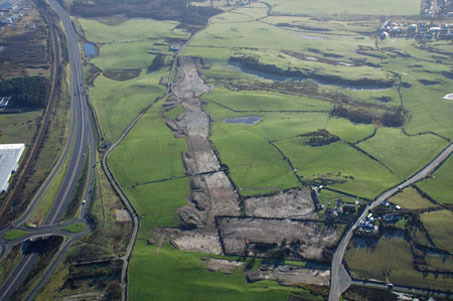 Another shorter phase of excavation was carried out in September 2009 to February 2010 revealing a Roman industrial site and further evidence for activity in the Neolithic period. The excavations on site have finished for now, although more may be done in the future, but other aspects of the work goes on. The post-excavation programme involves studying all the finds and records and this work will eventually lead to full publication of a report on the site.